Workers at Foxconn's factory in Shenzhen are shown assembling electronic components in this 2010 photo. NEW YORK (CNNMoney) -- An independent labor-rights organization that Apple joined last month said Monday that it began its inspections of the working conditions at Apple suppliers' factories in China. An audit team arrived this week at the vast Foxconn plant in Shenzhen, China, known as Foxconn City. The team plans to interview thousands of employees in Shenzhen and other locations about their working and living conditions, including their compensation and working hours, according to the Fair Labor Association. The FLA's team will also inspect manufacturing areas, dormitories and other facilities. The organization plans to begin publishing its findings early next month on its website: http://www.fairlabor.org/. The audit comes in the wake of growing public concern about labor conditions in the overseas factories that many U.S. gadget makers rely on to make their devices. Apple (AAPL, Fortune 500) is one of many companies that outsources its manufacturing, but as the industry's most popular and profitable company, it's under the most intense spotlight. Foxconn, one of Apple's largest suppliers, has drawn the harshest criticism from labor activists. A spate of suicides at the company's factories in 2010 garnered media coverage of alleged harsh working conditions, including unsafe facilities and illegal amounts of overtime. A story published late last month by the New York Times documented the human toll of a Foxconn plant explosion that killed several workers. Apple has conducted its own supplier audits since 2006, and releases some of its findings on its website. Its latest report, released last month, detailed nearly two dozen "core violations" of labor and human rights, including the use of underage workers. In more than 100 facilities, excessive work hours were "commonplace," according to Apple's report, and most of those plants failed to pay proper overtime wages. Two facilities were deemed "repeat offenders," and Apple cut ties with one of them. Partnering with the FLA on independent assessments is a new step for Apple. The company says that its suppliers have promised "unrestricted access to their operations" and full cooperation. "We believe that workers everywhere have the right to a safe and fair work environment, which is why we've asked the FLA to independently assess the performance of our largest suppliers," Apple CEO Tim Cook said in a prepared statement. Cook said the investigations "are unprecedented in the electronics industry, both in scale and scope." 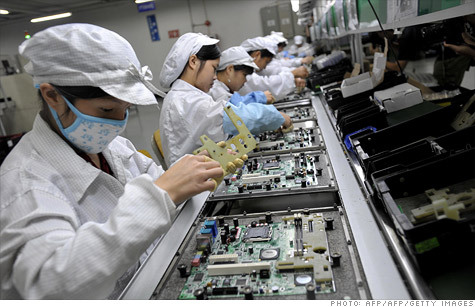 In a recent CNN segment, a Foxconn employee spoke out about her working conditions. The worker, who asked to remain anonymous, told CNN's Stan Grant: "They use women as men and they use men as machines. I almost feel like an animal." When asked why humans do machine-like work at Foxconn, she responded: "Well, humans are cheaper." She said she made less than $1 an hour for her labor. The FLA plans to conduct similar inspections this spring at two more Apple suppliers, Quanta and Pegatron. When complete, the FLA's assessment will cover facilities where more than 90% of Apple products are assembled, the agency said.